Looking good mate. I really like the blood splatter on them. I have to pull my finger out as the weekend draws near! Ahaha see my gabbo is coming thing has rubbed off on you! I’m guessing the humans are for a battle with Mr Heresy of some kind?? Love the big yins mate. Did you add the skulls or are they part of the sculpt? Cheers mate, and yes, all the skullage is part of the sculpt. Oh, my those big boys are stunning. Very nice skin colours. The zealots looks like a promise of cool stuff to come. The Flagellants kit is one of those kits I had my eyes on for a long time but never gotten around to pick up. You can’t really go wrong with religious madmen prone to hurt themselves (and everyone else too I guess). Much looking forward to see what you can do with these models. Very nice in deed and I’m suitably intrigued to learn what’s coming! Cheers dude – they weigh a ton, I’ll tell you that much! Whoa! That’s one big pair of Kroxi-guys! The colour choices on them look pretty effective, but then I saw their huge size. Very impressive! Pretty sweet looking. So that’s what they look like outside of Blood Bowl. I see all those scales to highlight, whew! I like those human figures, very cool looking. Looks like you’re a fan of the prime and wash method too. 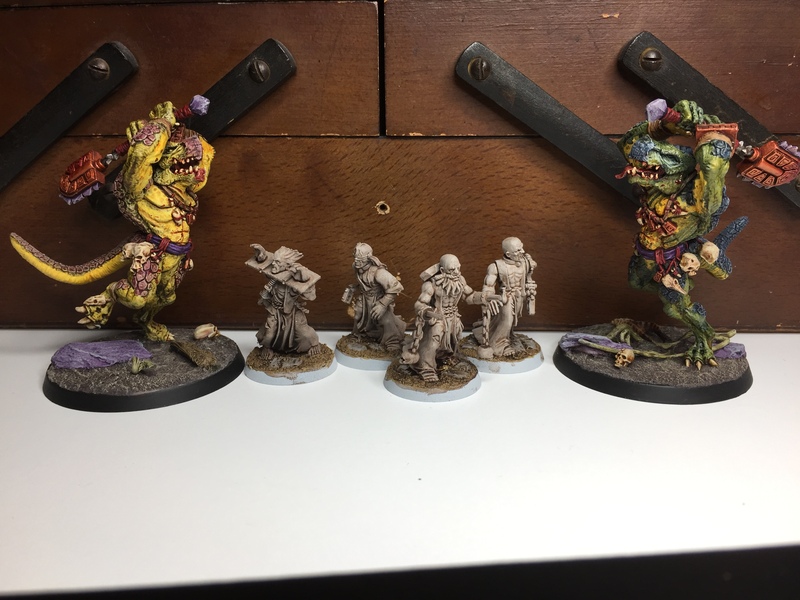 Thanks man – I cheated on the scales with washes & drybrush ;-) As for the others, I don’t normally prime & wash, but I’m in a hurry with these guys, and they’ll be pretty drab anyway… TL;DR – I thought I’d give it a go! Very nice! I think “big” is a bit of an understatement! Wow Alex, these are impressive beasts! 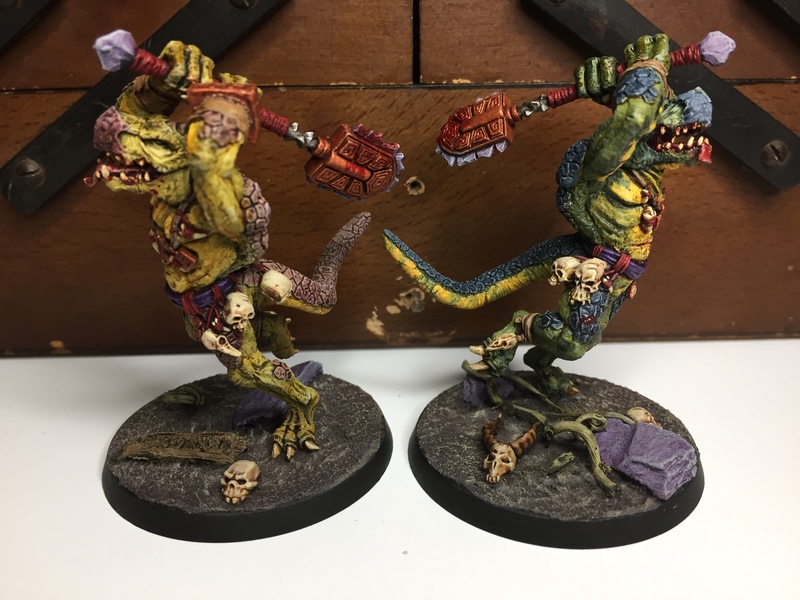 Love the color scheme, and you did make them look quite aggressively hungry! Looking good man, I sure pity dem li’l humies! 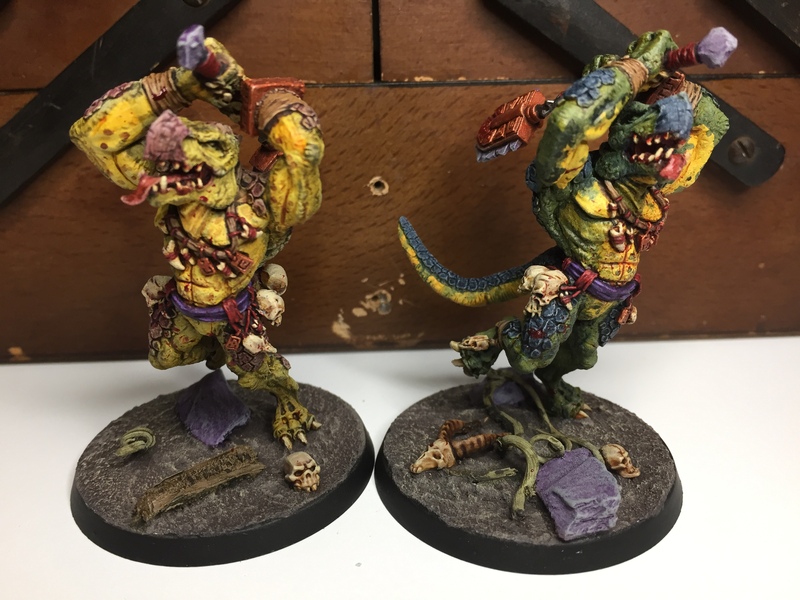 These guys look awesome! :D Nice work!